The sun unleashed its strongest solar flare in four years last night (Feb. 14), hurling a massive wave of charged particles from electrified gas into space and toward Earth. The solar storm sent a flash of radiation that hit Earth in a matter of minutes. Now a huge cloud of charged particles is headed our way. These coronal mass ejections, as they are called, typically take around 24 hours or more to arrive. They can spark spectacular displays of the aurora borealis, or Northern Lights, at high latitudes and sometimes even into the northern United States. On Feb. 13th at 1738 UT, sunspot 1158 unleashed the strongest solar flare of the year so far, an M6.6-category X-ray irradiance magnitude blast. 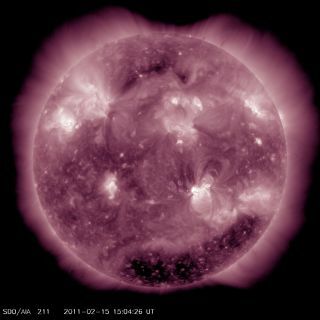 NASA's Solar Dynamics Observatory recorded an intense flash of extreme ultraviolet radiation. The source of this activity, sunspot 1158 is growing rapidly. "It has been the largest flare since Dec 6, 2006, so a long time coming," said Phil Chamberlin, deputy project scientistfor NASA's Solar Dynamics Observatory, which observed the flare. "There were some clues that led us to believe the likelihood of moderate to large flares (M class or above) could occur, but we were all surprised when it actually happened to be a large X-class." "It just means that Solar Cycle 24 is ramping up!" Chamberlin told SPACE.com. "This is the first of probably many more X-class flare to occur over the next 2 to 4 years as we reach the peak and then descend back down from solar cycle 24 maximum." Preliminary coronagraph data from STEREO-B and SOHO agree that the explosion produced a fast but not particularly bright coronal mass ejection (CME). The cloud will likely hit Earth's magnetic field on or about Feb. 15th. High-latitude sky watchers should be alert for auroras. Yesterday's Class X flare erupted at 8:50 p.m. EST on Feb.14 (0150 GMT Feb. 15). SPACE.com staff writer Denise Chow contributed to this report. You can follow SPACE.com senior writer Clara Moskowitz on Twitter @ClaraMoskowitz.